There it is, partway up the pretty walk from the eastern end of Trinidad's Indian Beach: a green sign, warning that one branch of the trail is for pedestrians and daylight use only; no dogs or wheel-borne travelers allowed. Head along that grassy bluff trail, owned by the city of Trinidad, and you'll hear waves crash, gulls cry and maybe the pit-pit-pit of a covey of quail flushed from flowery shrubs. Too soon, you'll come out in a driveway on Wagner Street -- where you'll see a forbidding No Trespassing sign. So ... um ... did you just trespass? Nope, not according to both the city of Trinidad and a board member of the Trinidad Coastal Land Trust, which owns an easement across that driveway that allows people to walk down to the city's trail and the beach below. The driveway owner, John Frame, declines to comment for the record. 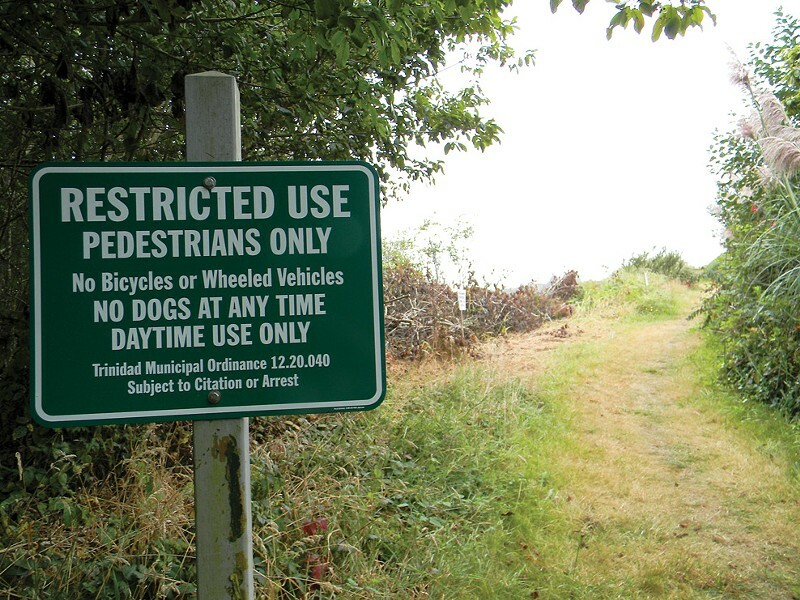 The dueling-sign dichotomy has its roots in years of costly litigation among Frame, the city and the state of California over efforts by Frame to close off public access to the trail that runs behind his house. The parties reached an uneasy truce in 2005, but tensions remain. "It's a sticky, ugly and misleading situation," says Trinidad City Manager Karen Suiker. The city regularly gets complaints about confusing signs at the easement and at the entrance to Wagner Street, which Trinidad contends is also public. So, to clarify, here's how to find a lovely alternate walk down to Indian Beach, as long as you leave the dogs at home: Park near the Trinidad lighthouse or the corner of Ocean Avenue and Wagner Street. Walk down Wagner Street, past the "Private Drive, please Do Not Enter, Residents Only" sign. 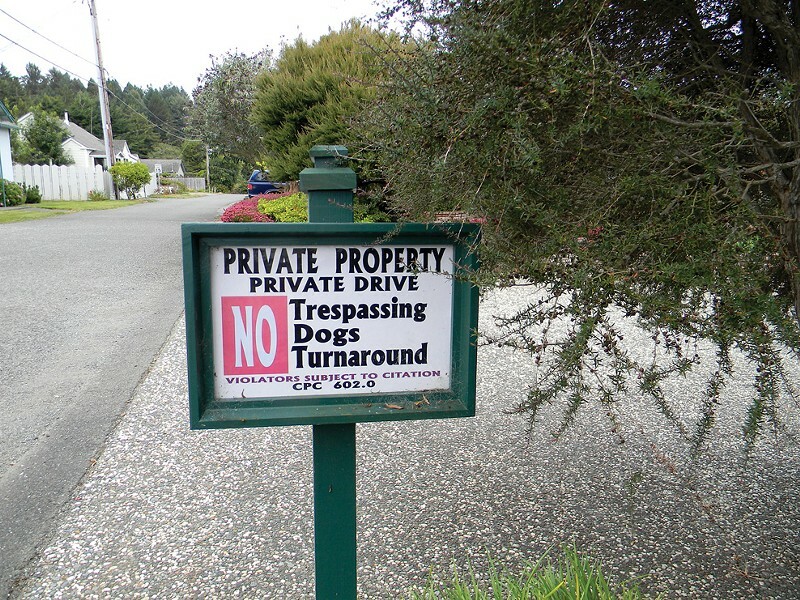 Turn into the first driveway on your right, the asphalt one beside the sign that warns in bold red and black letters: "Private Property, No Trespassing, Dogs, Turnaround." Walk politely down the driveway along the unmarked easement -- it's there, and you're entitled to it -- through a set of blue posts and onto the city trail.